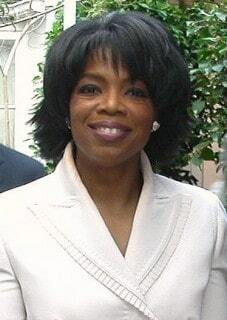 Oprah Winfrey might be in danger. She could be thinking she is better at promoting Australia than the people who live there. In an eight-day visit, likened to a Papal tour, Oprah has just finished filming four episodes of her talk show which will be broadcast in January. They are the first of her shows ever to be produced outside of the USA and will be part of her final series – she is bowing out of the show after 25 years. In an interesting move, the shows were filmed at the renamed “Sydney Oprah House” where Oprah handed out pearls to every one of the 6,000 audience members and gave a $250,000 cheque to just one sufferer of cancer. She then reportedly added: “I have named myself an unofficial ambassador for Australia and I have the biggest mouth on Earth.” Do you think she was trying to impress…? New research, however, suggests that she could well have been underestimating the effectiveness of the Australians themselves in promoting their nation. The series of studies from Central Michigan University showed that when we try to impress other people we seriously underestimate their abilities and skills on the same topic. The research also showed that you underestimate someone else’s abilities when you try to impress them and you can’t even see them. Merely connecting with someone – such as on the phone, or via email, can lead you to undervalue their capabilities. Essentially, what the research demonstrated was that when you attempt to impress someone with your knowledge or abilities, you tend to assume they are worse than you. That is clearly dangerous; after all they might know more than you…! It is possible that the Australians might know more about promoting their country worldwide than an American TV chat show host. What this new research reveals is that you are much better off being yourself and not trying to impress anyone. Indeed, when teenage boys set out to impress girls, what happens? They are generally sniggered at. Meanwhile, the boys who just behave normally, get the girls. It’s the same on TV – a study several years ago of newsreader likeability showed that the TV newsreaders who were most liked behave the same off-air as they did on-air; there was no difference in persona. Meanwhile, the newsreaders who set out to impress on-screen, were rated as the least likeable by the audiences. It all adds up to – be yourself. So, whenever you are on Facebook or Twitter, or when you are writing a blog post – indeed anything online – just be you. Don’t try to impress your readers or your online connections. If you do, you will inevitably think less of your audience in some way – and guess what happens then? That’s right, ultimately they think less of you. I wonder what the Australians will think of Oprah next January when they see the shows…? How good are you at these five valuable digital skills? There are five essential digital skills, yet 23% of small businesses in the UK don't have them. Do you?